A computer network can be “monitored” in many ways. You can measure the traffic and get an idea or can have a look at a log file (of a Firewall) for instance. But nothing can give you a clear idea about a network as good as by using a network traffic monitor that “simulates” your network graphically. But the more complex the network the more complex the output will be. Still, it is pretty handy in many situations. In that sense, EtherApe is a simple yet an extremely powerful network traffic monitor that has the ability to display your current network activities (IP addresses, inbound/outbound traffic etc) graphically. Whether you have a single PC connected to Internet or a router based small home network, by based on the IP addresses on the network it can create a colorful graphical representation of your network easily (a colored “link” and a “dot” is assigned to each “node” in your network). It updates the details by using both live and history of the network traffic. For instance, as you can see with the above picture, 192.168.1.1 is my Router’s IP address (local IP actually) and “gayan-PC-LL700ED.local” is my computer. And the other IPs are then web sites opened in my web browser. And each line represents my PC and the communication between that opened web site. Let’s say that I went to CNN home page, then as soon as I’m entering the CNN, EtherApe creates a list of new IPs and will start to link to them from my IP address (192.168.1.1 and “gayan-PC-LL700..” in this case). The more thorough my connectivity with the site the more bigger each “link/line” will look (as shown below). As you can see, when entering CNN, EtherApe actually showed my that a whole list of other web sites (outside of CNN of course) were also automatically connected (pinned) by my web browser (such as Facebook, Twitter etc) because they’re usually in CNN website’s sidebar. *. Extremely simple and easy to use interface. *. Supports IPv4 & IPv6 (and TCP). *. Uses different colors to represent different type of network protocols & layers. *. Change the colors and line width and radius values for representing they activities. *. Pause or Stop the monitoring process manually (it does take some CPU power while running). *. View Nodes (IP addresses of your incoming/outgoing traffic) and Protocol in a new window which shows you advanced information such as network bandwidth usage, instant traffic details, total packet (sent/received) etc. *. You can also double click on any “node” or a colored “link” in the graphical window and it opens up a new window that shows advanced details for that individual “node” or the “link”. *. 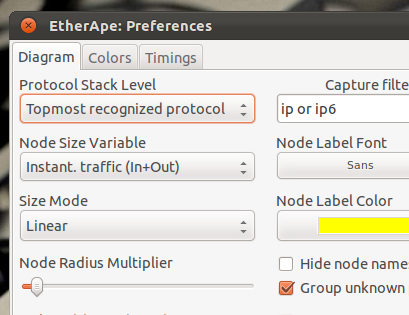 Change a whole lot of other settings such as: Diagram refresh/update period, timeout settings for nodes/link/protocols etc using the Preference window. *. 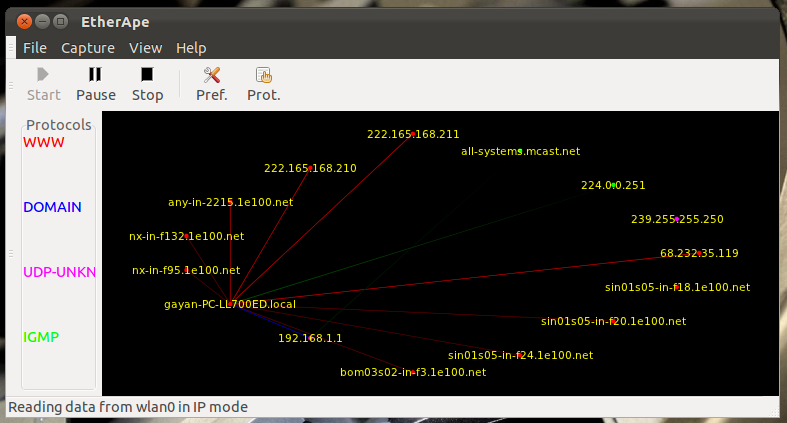 Hide node names (which should remove the IP addresses and web server names) to clean up the diagram section a bit ;-). *. Switch between “live” or “history” based diagram creations. *. Change network interface: WLAN, Ethernet etc. You can install EtherApe in Ubuntu 12.04 Precise Pangolin, 11.10 Oneiric Ocelot, 11.04 Natty Narwhal, 10.10 and 10.04 by typing the below command in your Terminal window. For other distributions or to get more information, please visit this EtherApe home page. It basically has two modes. A user mode (which gives slightly less info) and a administrator (root) mode which should give you access to all the network related information. That’s all I have to say about that ;-). Good luck. ashmon is nice tool too , you can use it for monitoring.